O plus official fan-page has recently announced the O+ Fab 3G, also revealing a list of places where you can buy the O plus Fab, which will be shown later. The Fab features a phone functionality and the same a tablet. While your first impression would be "just another tablet", well yes. Another tablet that has some features not found on other local brands. Commonly tablets are pack with 2MP camera with no LED flash at all, but O+ Fab 3G has just remove the tablet standard, making 5MP camera with LED flash, enough specs for taking pictures at low light environment. The fab can be compared to leading tablets brands when it comes to slimness, the space between the frame and screen would be just a few centimeter, carrying it would feel like holding the screen alone. The design doesn't stand out from the rest, just a classic design with O+ logo at the back with no physical buttons. 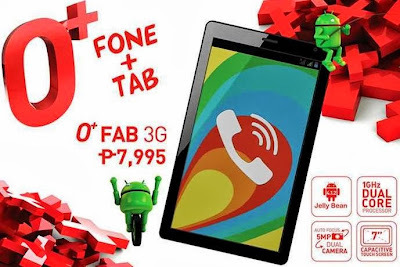 O+ Fab 3G has been integrated with MT6577 1GHz dual-core processor CPU, not the fastest processor out there, but according to O+ these tablet will be their entry level, so maybe we should expect more powerful tablets to come, especially its near Christmas. Powered by 1GB RAM, and 8 GB of internal memory (5GB usable). O+ official kiosks and stores nationwide.